Colin Dexter, in one of his Inspector Morse novels, gives us a really good insight into the mind of a gambler. The urge to gamble is so universal, so deeply embedded in unregenerate human nature that from the earliest days the philosophers and moralists have assumed it to be evil. Cupiditas, the Romans called it - the longing for the things of this world, the naked, shameless greed for gain. It is the cause, perhaps, of all our troubles. Yet how easy it remains to understand the burning envy, felt by those posessing little, for those endowed with good aplenty. And gambling? Why, gambling offers to the poor the shining chance of something for for nothing. Crude analysis! For to some it is gambling itself, the very process and the practice of gambling, that is so immensely pleasurable. So pleasurable indeed that gambling needs, for them, no spurious raison d'etre whatsoever, no necessary prospect of the jackpots and the windfalls and the weekends in Bermuda; just the heady, heavy opiate of the gambling game itself, with the promise of its thousand exhilarating griefs and dangerous joys. Win a million on the wicked spinning-wheel tonight, and where are you tomorrow night but back around the wicked spinning wheel? Colin Dexter, Last Seen Wearing, Chapter twenty-one. 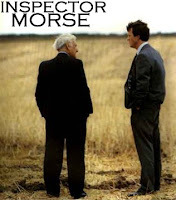 The website of the Inspector Morse TV series is here.